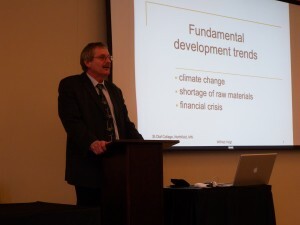 These were the words of Wilfried (Willi) Voigt, Germany’s former Secretary of Energy, as he presented environmentally friendly energy producing ideas and methods at a conference held at St. Olaf on January 9, 2009. Sponsoring the conference was John Farrell of the Institute for Local Self-Reliance (ILSR), an organization that supports environmentally sound and particularly local community development. For Minnesota the information ILSR has developed on the Feed-In-Tariff (FIT) program is of particular interest. The FIT is a simple yet powerful strategy to expand renewable energy and benefit local economies. It works as a mandated, long-term premium price for renewable energy paid by the local electric utility to energy producers. For example, Xcel, our local energy producer, would be required over a period of time (say 20 years), to pay for each KWH (kilowatt hour) produced, from a wind turbine or solar panel, that feeds into the existing power grid. This negotiated price and length of contract may be adjusted for inflation and the tariff rates will be set to allow for reasonable profits and no more. Other speakers at the conference were Paul Gipe from Wind-Works, whose presentation on the Renewable Energy Payment (REP) background, its design and comparison to Renewable Portfolio Standards, was very interesting. For more information visit his website . 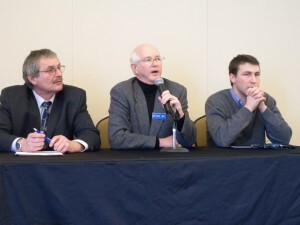 Also present was Betsy Engelking (Xcel Energy), Glenn Skarbakka (Great River Energy) and Frank Fredrickson (MN Power). They presented the industry view of REPs.
Wilson Rickerson of Rickerson Energy Strategies, a Boston based consulting group, also presented new clean energy ideas and technology trends that are rapidly reshaping our world. As Willi Voigt said “Ecology is long term stabilized economy.” In this day and age, stabilizing the economy is of utmost importance. I believe the REP program would work very well in Minnesota. In the future look for more information on the Renewable-energy-paymnet program I am working on in the state legislature. I will keep you updated on further progress. ILSR has posted the presentations on their website you can find them by clicking on this link: presentations. Videos of the presentations should follow soon.